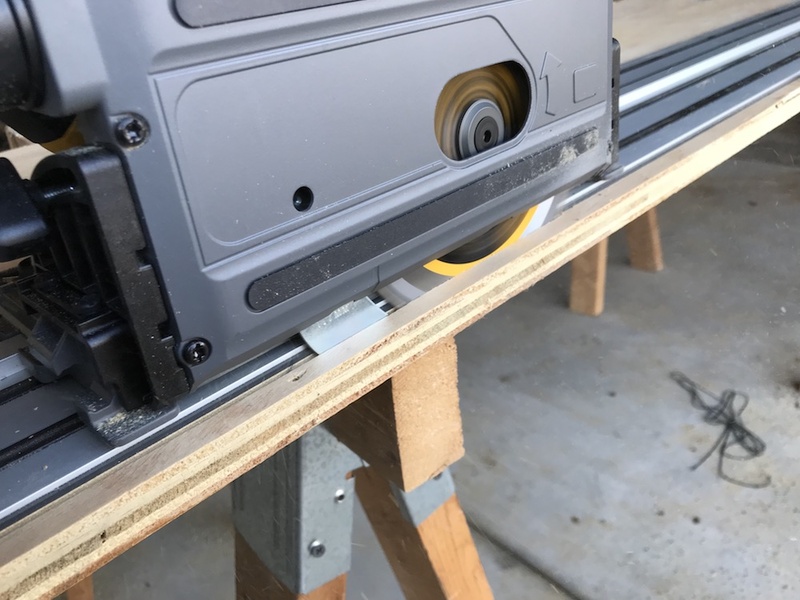 Prepping the DeWalt FlexVolt TrackSaw for its first ride on the rails only takes a couple of minutes. Step one is to take the slop out of the saw-to-track connection. When you first set the saw on the track, there’s a bit of side-to-side play to get rid of. Two adjustment knobs, one up front and one in the rear, make that easy to do. In the manual, they use a hex wrench to adjust track play; if you go that route, it’s a 2.5 mm Allen wrench. It’s a whole lot faster to just grab a narrow slotted screwdriver. Just loosen the two set screws, adjust the knobs until the slop is gone, and re-tighten the set screws. Just make sure the saw still travels freely along the rails before you snug things up. 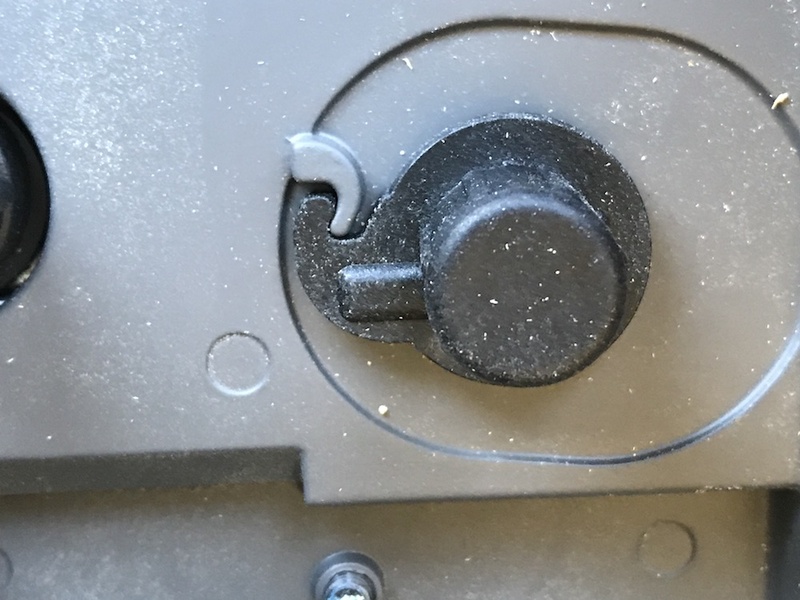 Adjust the front and rear knobs to remove slack, and re-tighten the set screws. The final step is to trim the rubber anti-splinter edge from both sides of the track. 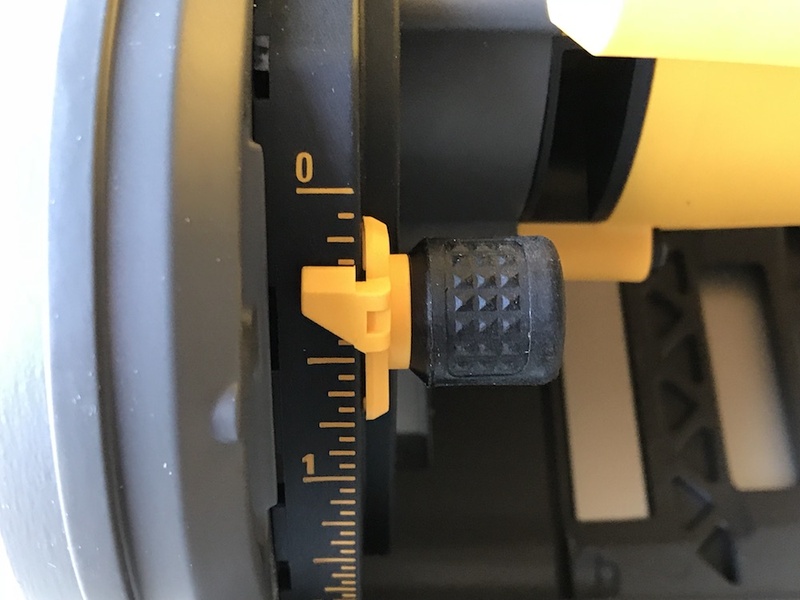 Just set the blade depth to 3/16”, set the track on a flat, sacrificial surface, and run the DeWalt FlexVolt TrackSaw from end to end. Then turn it around, and do the same to trim the edge on the opposite side. Now you have a perfect, zero-clearance edge on both sides. To trim the edge guide, set blade depth to 3/16″, and let ‘er rip. The saw comes with the blade already installed. The saw takes a 6-1/2” blade, and the 42-tooth blade that comes with the saw provides a really nice, smooth cut. 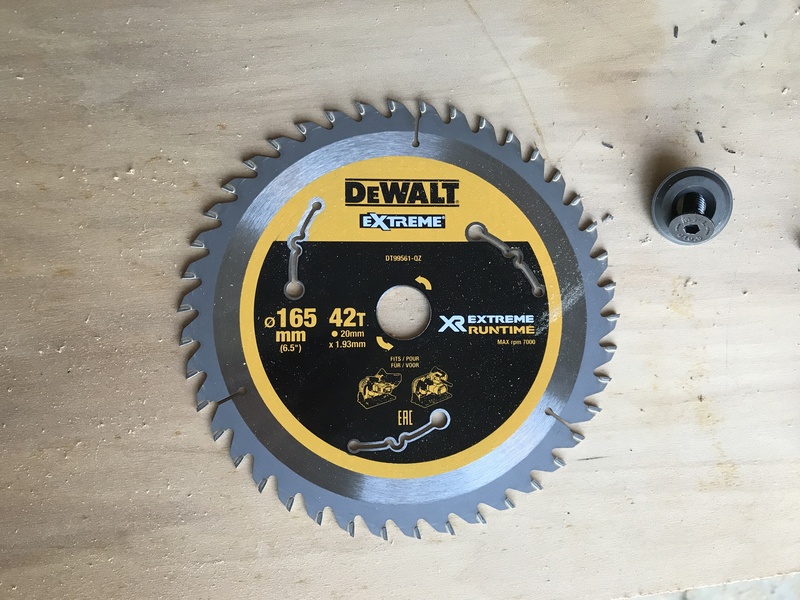 The included 42-tooth blade provides a very nice, smooth cut. Blade changes are easy. The wrench stows in the handle. I made several test cuts with the The DeWalt FlexVolt TrackSaw, all of them in 3/4” cabinet-grade plywood. The saw is very easy to operate: push down on the plunge button, pull the trigger, and push the saw forward and down. It plunges very smoothly, and glided along the track easily, with absolutely no play. Ready to cut? Push the plunge release button, pull the trigger, push down & cut. I made some right-angle cuts, then set the bevel to make some 45-degree cuts. The bevel can be adjusted up to 47 degrees; the bevel angle is easy to adjust and locks solidly in, thanks to front and rear bevel locks. 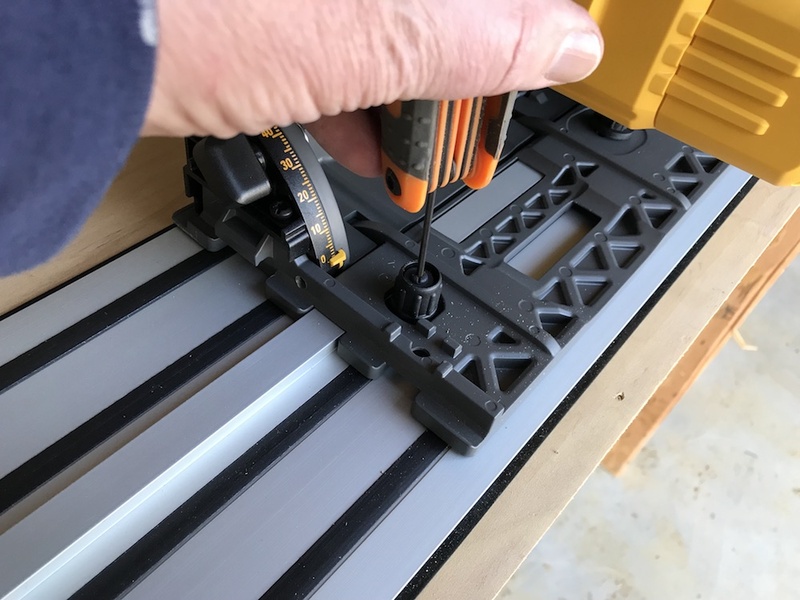 The DeWalt FlexVolt TrackSaw glided along smoothly for both types of cuts, and the anti-splinter strip stays right up alongside the blade, so on every cut I made, the cut edges came out very smooth and splinter-free. And at a 45-degree angle. There are bevel locks on both the front and rear. All the cuts produced a very nice, splinter-free edge. No-skid strips on the bottom of the track keep it nicely in place. 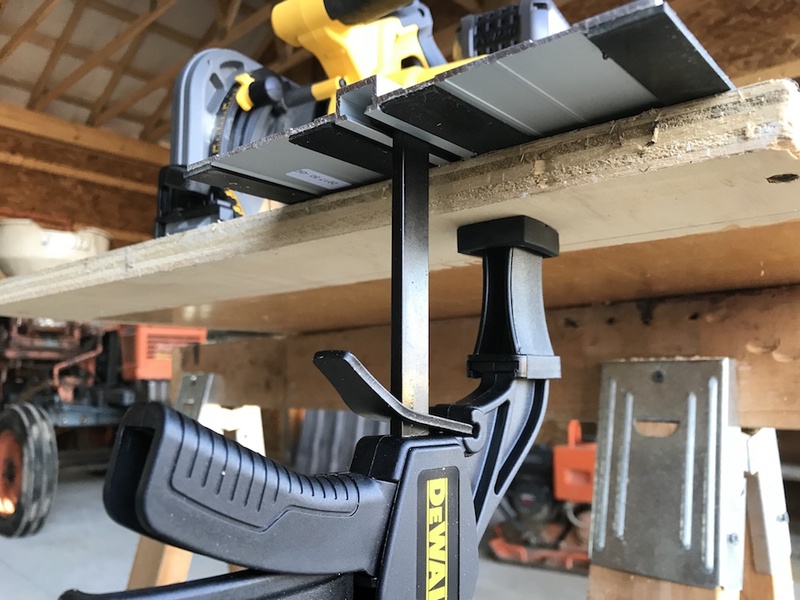 The DeWalt FlexVolt TrackSaw also features an anti-kickback mechanism, that prevents the saw from traveling backward or coming out of the track. It’s fast and easy to engage or disengage, using a knob near the center of the base plate. 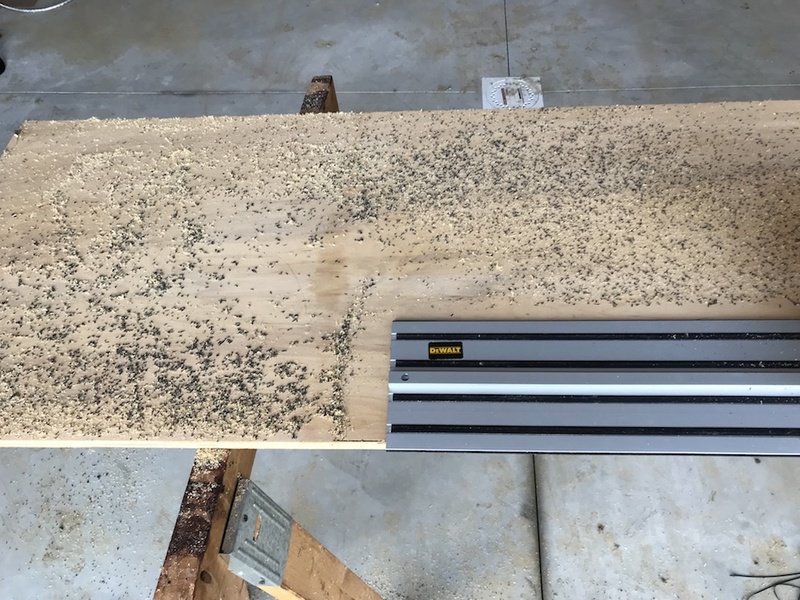 It works great; when I engaged it, the saw wouldn’t move backwards in the track at all. For normal cutting, keep the anti-kickback mechanism disengaged. For plunge cuts or vertical cuts, the anti-kickback should be engaged. 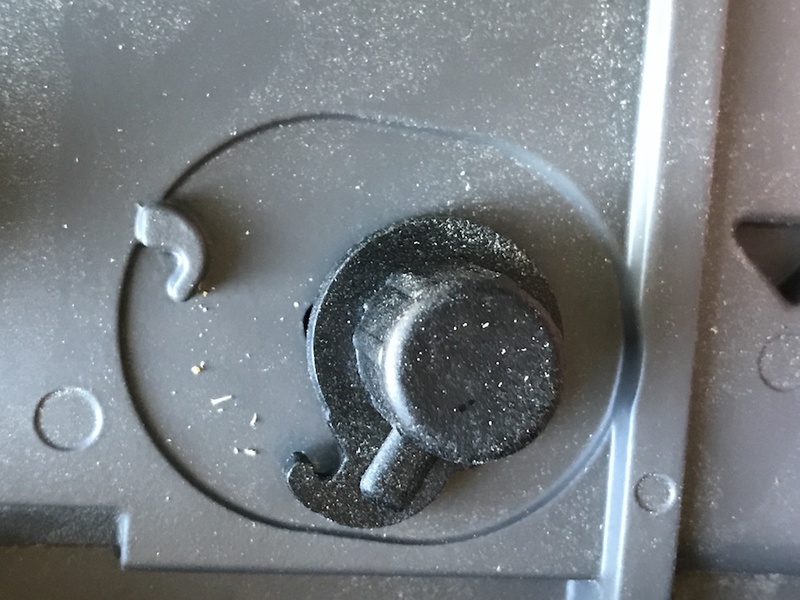 One thing to note: There is a swiveling dust port, and the shroud over the blade does a great job of directing almost all the sawdust through that port. 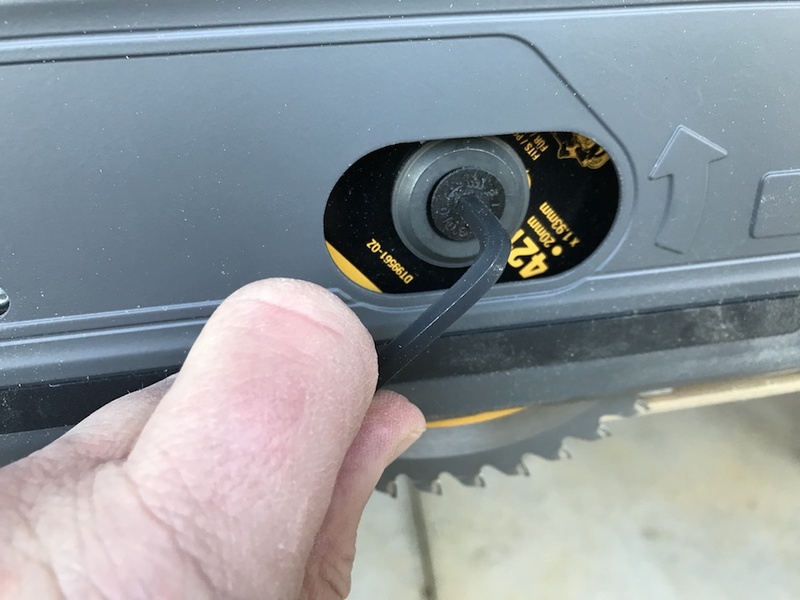 The DeWalt FlexVolt TrackSaw doesn’t come with a dust bag, so unless you don’t mind sawdust all over you, and everything else close by, you might want to hook up to a shop vac or other dust-extraction system. Yes, those are the among most expensive words in the English vocabulary. 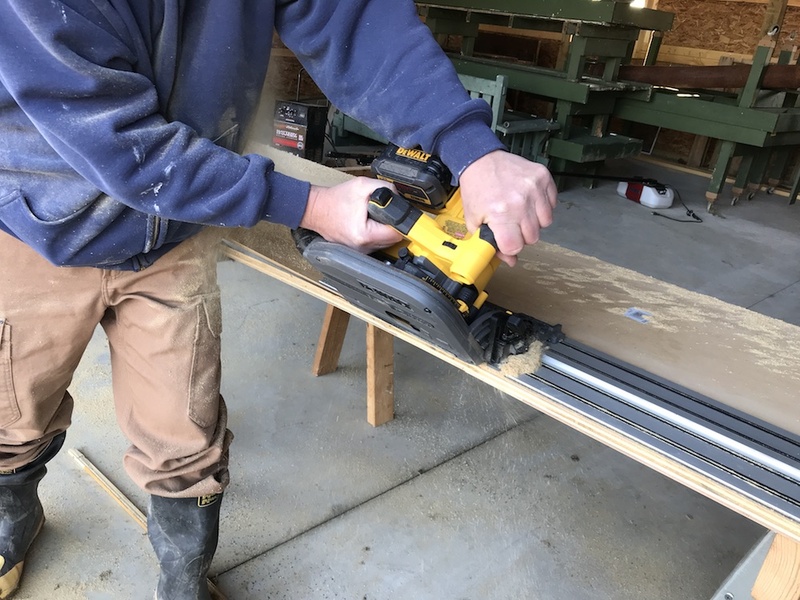 In this case, though, a relatively minor investment will provide a lot of additional utility and protection for your DeWalt FlexVolt TrackSaw. Everything you need to get cutting in two easy-to-carry cases. DeWalt sent us two pieces of track, a 46” section and a 59” section. The track is also available in a super-sized 102” length. 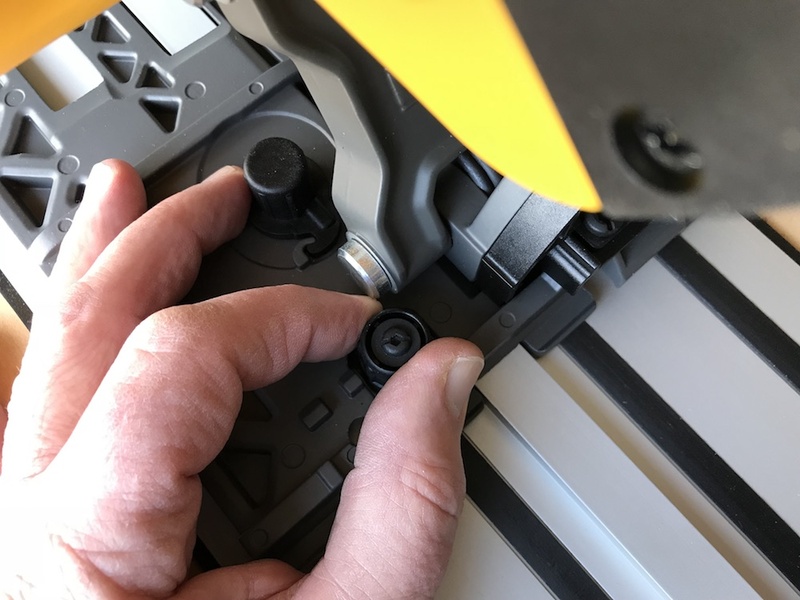 DeWalt also makes connectors, to attach any two pieces of track together. To protect the tracks, and make it easier to schlep them around, I bought the optional carrying case. It will accommodate both the 46” and 59” sections of track, with room left over for clamps and other odds and ends. To further protect the tracks, I kept the pieces of masonite they shipped with, and stuck them in the bag alongside the tracks. 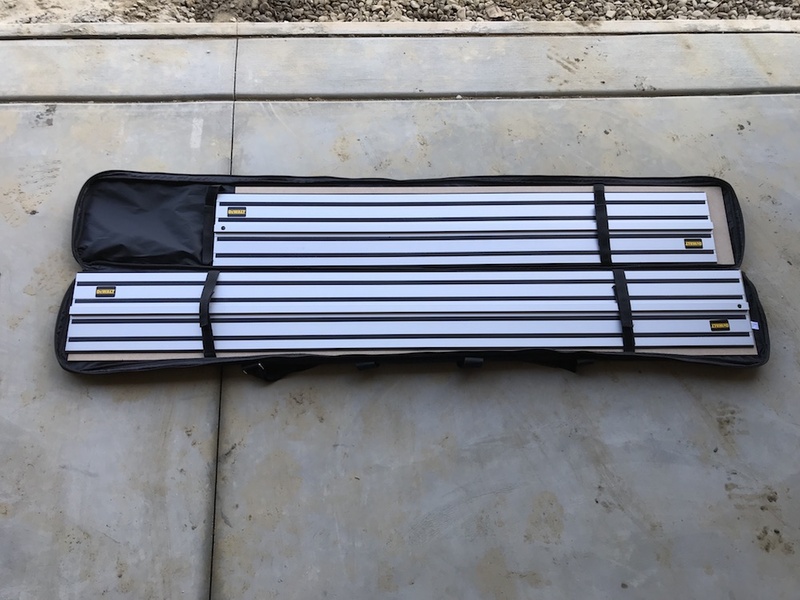 The carrying case protects the track, and makes it much easier to transport. The other accessory I bought was a pair of track clamps. 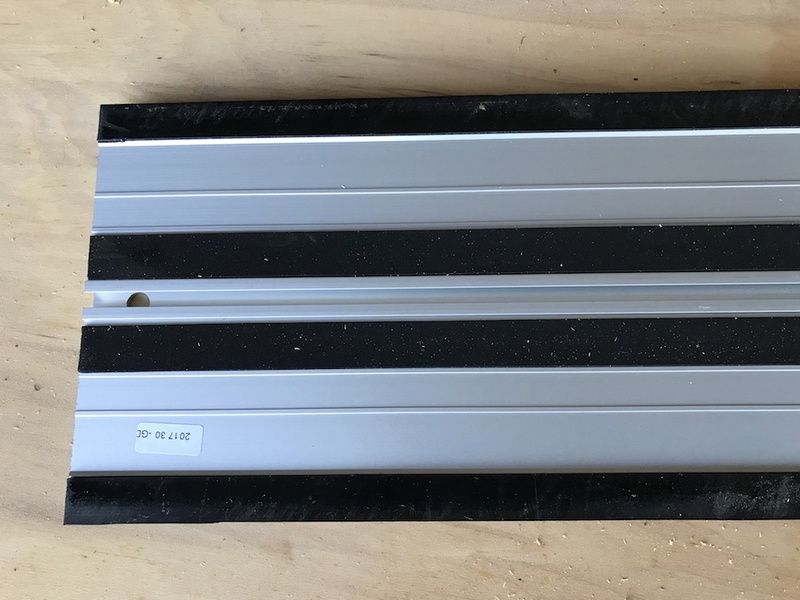 Designed specifically for use with the DeWalt TrackSaw track, they hook into the channel beneath the track sections. 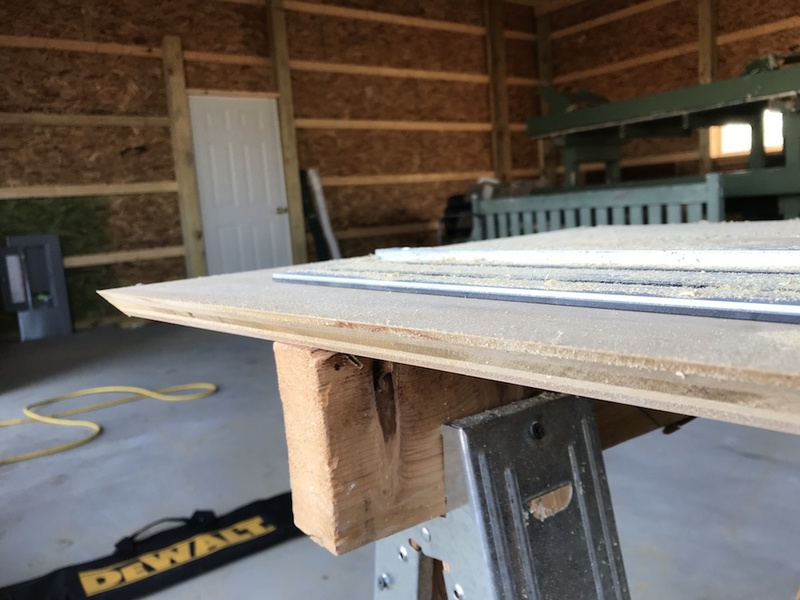 They can be slid to any point along the track’s length, making it easy to secure the track to a pair of sawhorses or your workbench. 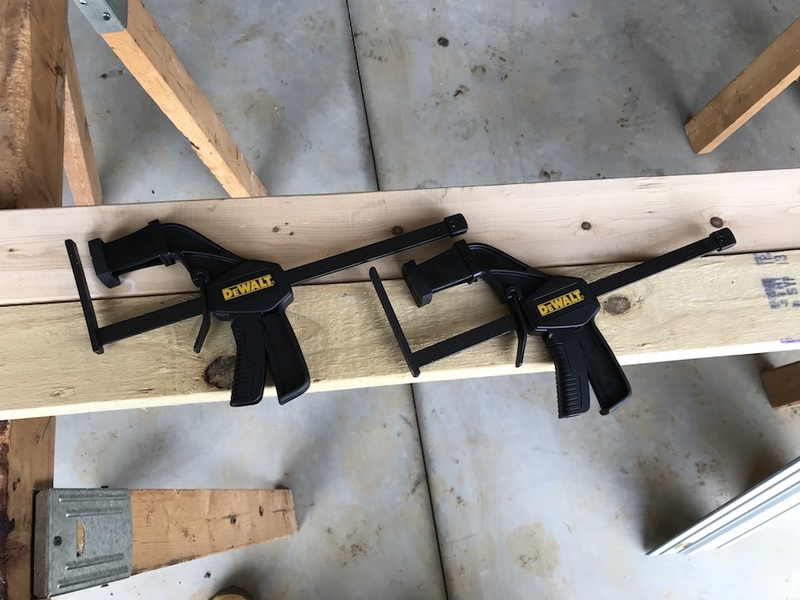 DeWalt sells a pair of clamps designed specifically for their track. The clamps are out of the way, and can slide the full length of the track. Wanna get even more use out of your track? 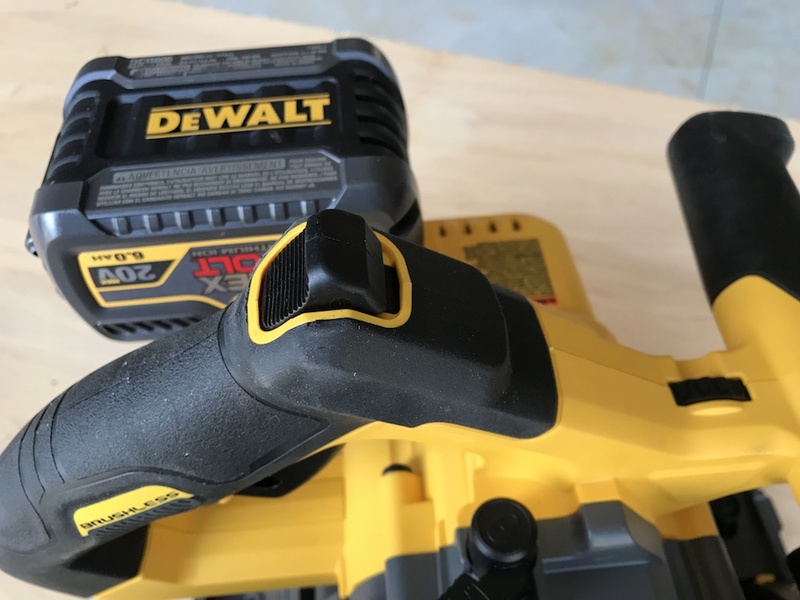 DeWalt also offers a router adapter, the DeWalt DWS5031. 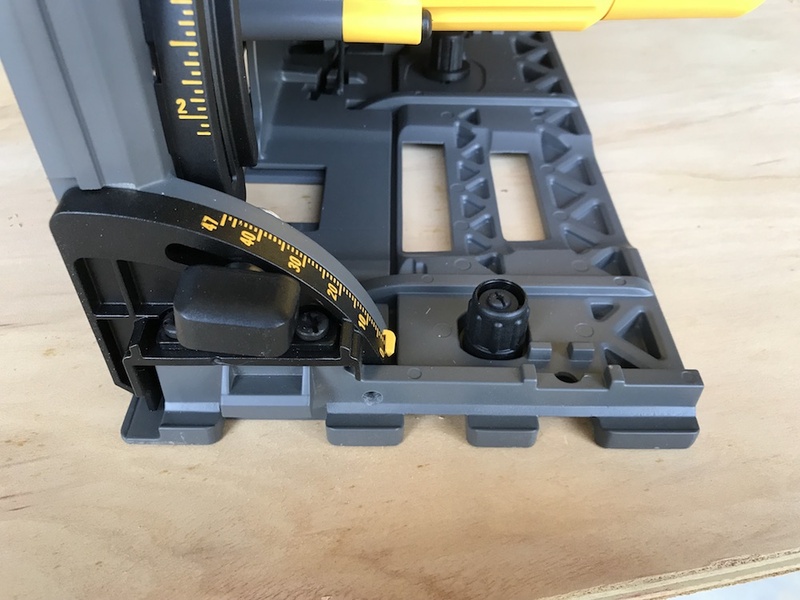 The adapter enables you to use most routers with your TrackSaw tracks, to get perfectly straight routing along any line. The package includes adapters for use with DeWalt and Porter-Cable fixed base and plunge routers. Time To Track One Down? Although I’m not abnormally anti-social, and I bathe regularly, I still end up working solo much of the time. I’ve ruined more than one piece of material on the table saw, by not being able to keep it perfectly straight all the way through the cut. Using the DeWalt FlexVolt TrackSaw, I can safely and easily make perfect cuts in sheet goods or lumber of any size. My upcoming project list includes building some upper cabinets, cutting some angled filler strips out of oak, and cutting down some solid oak doors, so the saw won’t be spending much time in its cozy TSTAK case. One of my new favorite tools. Overall the saw seems very well constructed. It has a very solid look and feel, and it’s comfortable and easy to use. 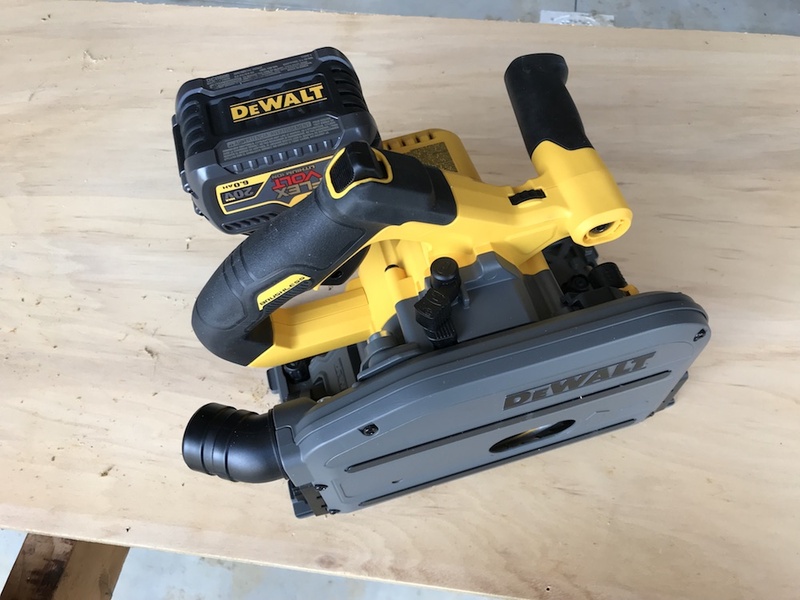 For all the cuts I made, the DeWalt FlexVolt TrackSaw had plenty of power. 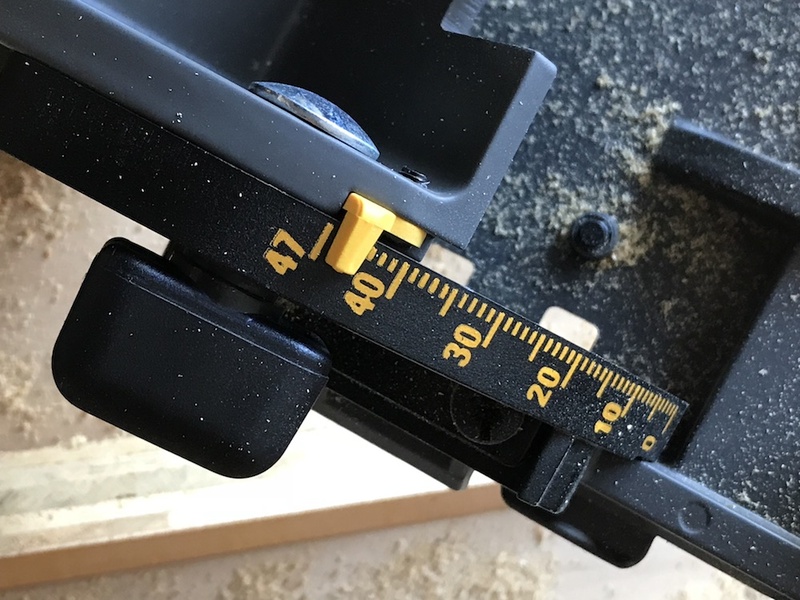 Adjustments are all fast and easy, and the cut capacity of 2-1/8” should be more than sufficient for most users. The depth of cut slider doesn’t seem very robust, but it works well and is pretty accurate. One minor quibble: The bevel indicator isn’t very precise. It’s about 1/8” thick, and it’s hard to tell exactly where to position it to set the angle. A pointed indicator would be more helpful. Getting on track is not for the faint of wallet. The DeWalt FlexVolt TrackSaw is available in three configurations: As a bare tool, for about $379; in the kit, with a 6.0 Ah FlexVolt battery, charger, and TSTAK case, for about $499; and as the kit with a 59” section of track, for around $579. That’s not cheap, but the quality is there, and for the pro who does a lot of off-site work, or solo work, it’s money very well spent. DeWalt backs the DeWalt FlexVolt TrackSaw and accessories with a three-year limited warranty and a year of free service. They’re also returnable for 90 days, to give you a risk-free chance to get your slicing and dicing on track. Amazing. 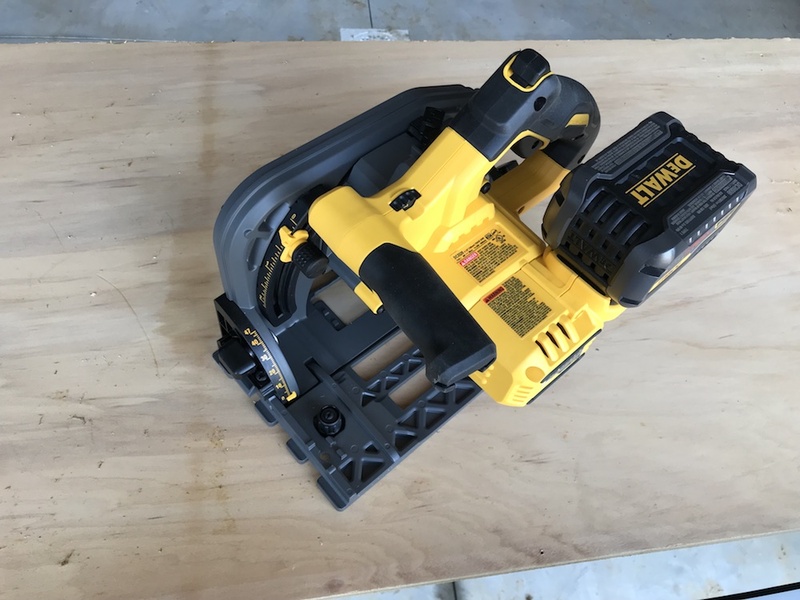 The Dewalt 60v FLEXVOLT tracksaw is certainly unique. Hi! 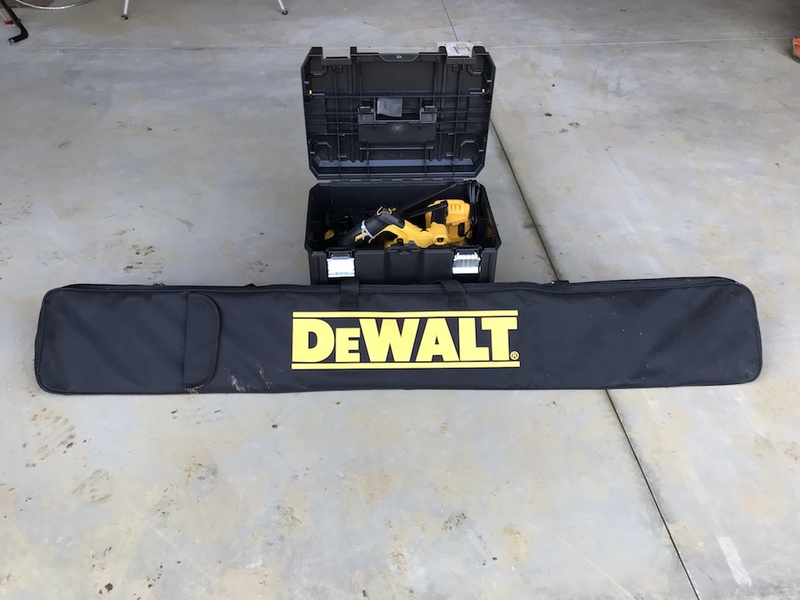 I was wondering about Dewalt’s tools, are they good for home use? or do they resist heavy work?